Ford Motor Co is an ongoing partner of Los Tweens & Teens. As always, we present our own point of view. 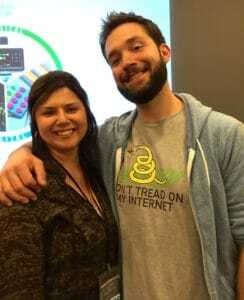 Alexis, founder of Reddit.com and myself at the Ford Trends Conference 2015. This June I went on a super-fun girls-only 6-day road trip from San Francisco to Los Angeles with my teen twin daughters, Sophia & Olivia, plus my best friend, Michelle, and her teen daugher, Gianna. The hotel concierge mentioned that we needed at least a full minivan or large SUV for the five passengers and all of our gear. We said we wanted a mid-sized car and by sheer chance ended up with a 2015 Ford Fusion. Did all the bags fit? YES! Five carry-on luggage in the trunk, a small wheelchair, crutches, six backpacks inside including 3 full-size teens and 2 crazy moms! Check out our photo BELOW to prove it! 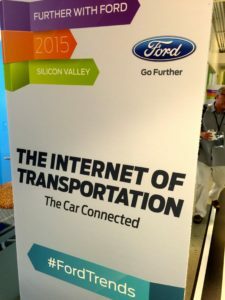 During the trip, I was thrilled to attend this year’s 2015 Further with Ford Trends Conference in Palo Alto, CA, which was all about Smart Mobility to create efficiencies to get us all to where we need to go in a smarter way. And who was the focus of an entire panel session? Generation Z – our tweens and teens! 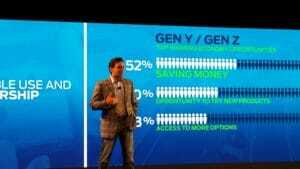 Ford Motor Co CEO & President Mark Fields discusses generational research that impacts car design and innovation.eration Z- our tweens and teens! From watches armed with technology that helps drivers find open parking spaces to alleviate driving and fuel consumption to the MoDe Flex, a car that comes equipped with a motorized bicycle to help drivers in congested urban areas get out during major traffic times and arrive at their destination via bike- it was all shared with attendees so that collectively we work to reduce environmental impact today and into the future. The event was held at the brand new Ford facility in Palo Alto that itself is modern and embraces the future today. At first thought it seems an odd location for a car manufacturer but once we visited Ford’s neighbors in Palo Alto that include SAP, the world’s largest enterprise software company – we quickly realize the innovation Ford is embracing requires them to be in the heart of the tech world. What I love about attending #FordTrends is the company’s focus on embracing current trends and applying that knowledge to current and future products, as well as the community initiatives supported by Ford. Aside from ‘tinkering’ with all of the upcoming products and feeling like I need to invent something tomorrow- my favorite discussion was of course about Generation Z. As the parents of Gen Z (Americans born roughly between 1995 – 2012) we have so much to learn from our children! But we have mucho guidance to provide them as well. As Gen Z grows up in a highly diverse (culturally) and tech-focused learning environment the products and services created for them will have to touch on key points to attract them. Ford research indicates that young Americans rank car rides second only to book lending as things they are most open to sharing pointing to ‘money savings’ as a key advantage for doing so. But more importantly over 33% of Millennials (many Gen Z parents) and younger surveyed indicated that having access to more options is the driver for sharing resources. And Ford, is paying attention to these trends by launching Peer-2-Peer Car Sharing– a pilot program for select customers in six U.S. cities and in London. 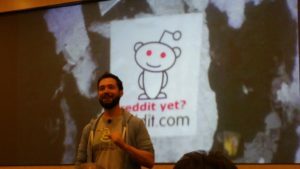 Among the many experts on hand and speakers, truly one of my favorites was Alexis Ohanian best known for co-founding the very popular social news website Reddit. As a non-parent I loved his simple suggestion that as parents we worry about our kids’ failure. But Alexis said we should know that his best ideas followed his biggest failures and that’s so important to allow. All in all I was motivated by so many stories to share. Of course we talked about the latest and future line-up of Ford vehicles that already have trends implemented into functions to make driving easier and more efficient. So the best part of trip actually came at the very end when we drove a Ford Fusion to Los Angeles. Ford already put into play an efficient family car with lots of storage and comfort- and it delivered. 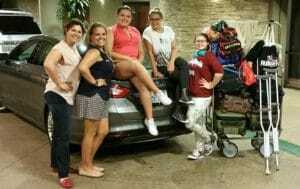 2 amigas, 3 teens, 5 bags, 6 backpacks, small wheelchair, crutches and 2 purses all in one Ford Fusion from SF to LA!! This entry was posted in For Mothers & Tias, Parenting Teens, Product Reviews, Teaching & Education Tips and tagged cars, Ford, Ford Trends, moms, teens, travel, vehicles. Bookmark the permalink. 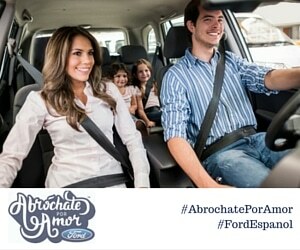 Me encanta la marca Ford es realmente cómoda, segura y económica!. Se ve que disfrutaron sobremanera ese viaje por California. Estamos pensando en cambiar de modelo y esta información sobre el Fusion me ayudará mucho. Gracias! Which came first, the problem or the sontuiol? Luckily it doesn’t matter. A coup d’Ã©tat is our only salvation…You can’t do that without public support for it. That support doesn’t exist.Anyway, with the inept way our political ‘leaders’ are handling the financial crisis, the whole elite simply may get washed away within a few years time. Those who wished to get rid of have a much better chance than I imagined even a year ago. Im sorry but I own an Android phone and an iPod touch and even if yourï»¿ numbers are true the App Store destroys android market. Just the overall quantity and quality of apps is soo much better. SO many android apps are 100% useless and there are far less. They have the basics at least. The way I see it is iPhone and Android do the same thing but the iPhone has a better app store and overall ecosystem that is supported so well with macs and iPads. Certes, mais ne confondez pas laÃ¯que et athÃ©e, cela n’a rien Ã voir. La laÃ¯citÃ© interdit Ã l’Etat de privilÃ©gier aucun culte, elle ne veut absolument pas dire que les idÃ©es religieuses ne peuvent pas s’exprimer ni n’avoir la moide influence dans la sociÃ©tÃ©. The trip looks like fun and the focus looks like the perfect car for the job! Thanks for sharing. 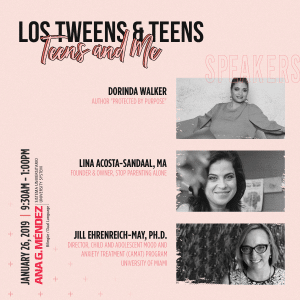 Se ven muy Interesantes ideas y propuestas de esta conferencia, tengo un hijo de la Gen Z, me encanta que se haya enfocado en ellos. Me gusta mucho la Ford y que buen espacio tiene. Que divertido, ese focus se ve genial! Qué lindo auto el Ford Fusion y qué interesante el concepto de dejar que los chicos exploren y se equivoquen…. Cómo cuesta ponerlo en práctica! Una gran experiencia, que bueno contar con estos espacios para ayudar a nuestros hijos a que exploren nuevos rumbos.